This time of year when your busy with the holiday preparations, it’s nice to have simple meal ideas to make for dinner. When it’s cold outside we love to have chili for dinner. We almost always have a chili leftover from the batch I make in the slow cooker. 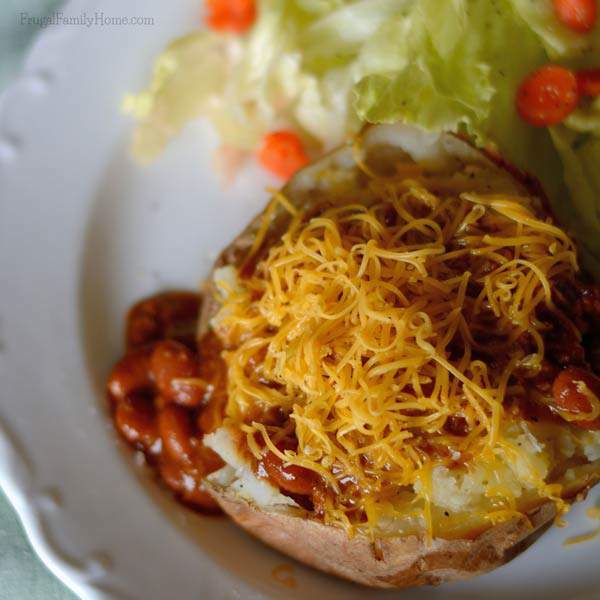 This is a great way to use up the leftover chili and have an easy dinner on the menu plan. You don’t have to use homemade chili or leftover chili. Using the store-bought chili will work great and makes for a really easy dinner too. I like to include lots of toppings to go with our chili potato bar. Things like cheese, sour cream, chives, diced green pepper are just a few ideas. 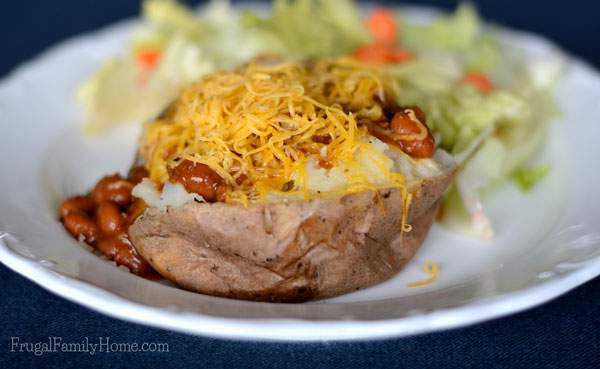 Whatever you family likes on baked potatoes and chili would work out great. Oh, I forgot bacon. 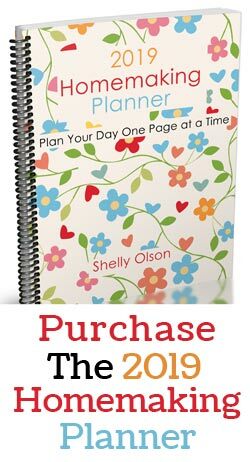 How could I forget it. It’s one of my favorite baked potato toppings. I love that this meal is so simple to make. I baked the potatoes in the oven. Be sure to prick the potatoes really well before placing them in the oven to bake. I always prick them all over, but lately I’ve had a few potatoes burst in the oven. So be sure to poke them really well. I bake the potatoes in the oven at 375 for about 60 minutes. I will check them after 45 minutes to see if they are done baking. Sometimes they will bake faster other times slower. I think it has to do with my oven being about 20 years old. If I have leftover chili, all I have to do is heat up the chili and put out the other toppings we will be having. Everyone gets to make their own potato, just the way they like it. My son prefers the skin off the potato with the potato mashed before adding the chili and toppings. My daughter and myself, are more traditional, adding the butter or sour cream to the potato with salt and pepper then adding the chili and other toppings. My husband leaves his potato dry and just adds the topping on top of the chili. To make this a full meal, I usually will serve the potatoes with a salad and some kind of bread to round out the meal, without too much fuss needed. These Quick Dinner Rolls would go with the baked potatoes nicely. 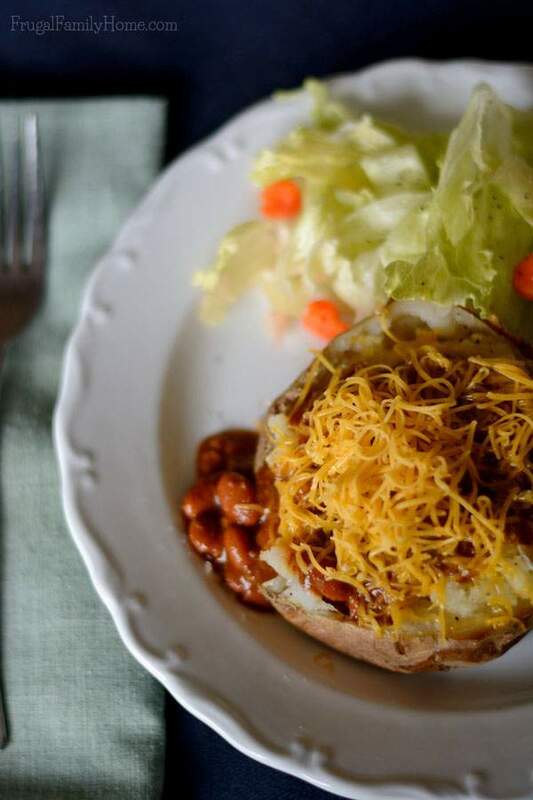 The next time you need a simple meal, grab a can of chili and bake some potatoes and you’ll have a wonderful simple meal for your family to enjoy. 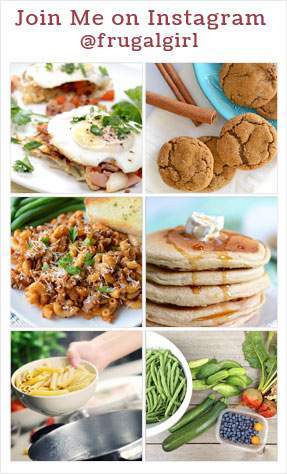 What’s your go to simple meal when you have a busy week? 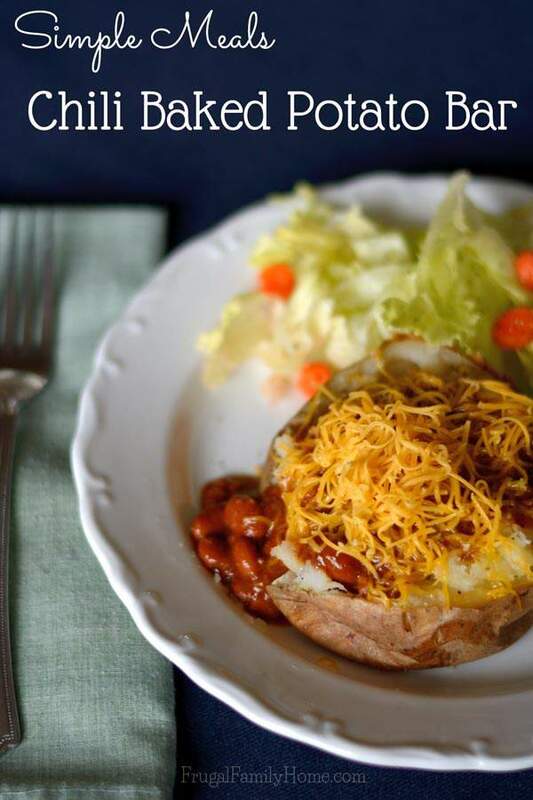 Chili and baked potatoes sounds good to me! 🙂 My favorite go-to meal is pasta. It’s easy and my kids enjoy it. This looks so good…I’m hungry for one right now! A few weeks ago, we made a baked potato bar for a dinner at our church and I couldn’t get over how yummy such a simple thing could be. It looks even better with chili. Great for football food! Thanks for sharing on Tasty Tuesdays!